Local vets work with vets from Racing Victoria to officiate at all race meetings. We work alongside the racing stewards who are in charge of the days racing. Two vets from Warrnambool Veterinary, namely myself and Dr Charlie Blackwood, will be working for the three days of the May Racing Carnival. 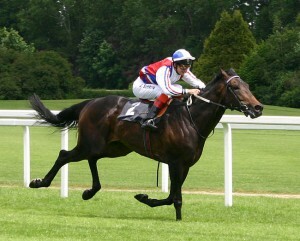 We are responsible for the veterinary care and attention of all the horses racing. This includes determining whether a horse is fit to run, and looking after a horse that may be sick or injured before or after a race. This may involve examining a horse if the jockey or the stewards have some concern about it. Our job is to decide whether it is fit to race. In this situation with the race being held up pending our decision, a quick but decisive decision needs to be made. In this role the vet is mainly working under the direction of the stewards. The stewards may determine that a horse had an uncharacteristically poor performance such as an unplaced favourite. We will examine the horse and try to determine if there is any condition or illness that may have had a detrimental effect on its performance, for example, lameness or even a heart condition such as atrial fibrillation. The findings of these examinations are reported back to the stewards as well as the trainers. The stewards will then include these vet reports in their official race reports. Most of the swabbing of horses these days is done by RVL vets but sometimes it is our job to take urine or blood samples as well. Drug testing is of course to ensure fairness in racing and also to prevent the use of drugs that may mask an injury. So it is in the best interests of both horses and punters that horses race drug free.